A band of lepers escape from a hospital and are hiding out in a secret cave. They emerge on occasion to rob people and steal supplies. A nearby town is beset, but the sheriff asks Santo to ride in and help. After establishing his credentials in the ring, Santo sets off to find out the leper situation is more than it appears to be. The Santo movies tackle a number of genres, naturally I'm most attracted to the ones that involve monsters, but the series has also touched on crime, science-fiction, and straight-up adventure. Riders of Terror is a very rare foray in the western. This does create the peculiar anachronism of a modern looking Santo wrestling in a modern looking ring set in the middle of a stock old west town. At no point does anyone mention what year it might be. I suppose, if the characters had just accepted Santo as is, then it would have been easy to roll with everything, but people are constantly asking him about his mask and why he wears it. 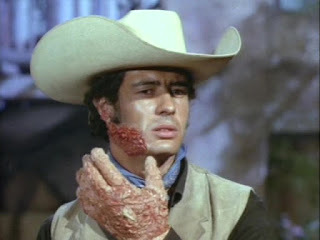 Here was an opportunity to tie Santo in to the tradition of other masked western heroes, such as Zorro, or the Lone Ranger, but the film is far too earnest to try and be even a little meta. "You got a little something on your face." The most surprising element of Riders of Terror is how serious and often brutal it is. I feel like The Wild Bunch (1969), a true turning point in the Western genre, was a big influence here. Both films are filled with amoral ambiguity, and fits of violence that spare very few people. The lepers are the main antagonistic force for most of the picture, but their motives have a little more depth than I would expect from the normally shallow storytelling of the Santo films. They want freedom from the leper hospital and to live like normal people, a fact which gets used against them. The struggle for Santo becomes not wiping them out, but unraveling who is manipulating them while keeping the already skittish townsfolk from slaughtering the fugitives. There is even a romantic connection, something, which in Santo movies, more often than not, existed merely to pad out the running time. Here it used to further humanize these disturbing looking characters..
"You got a little something on your... You know what? Never mind." 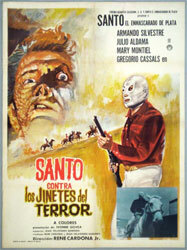 The largest flaw in the film is that there is nothing uniquely Santo. He could have been replaced with just about any cowboy character and aside from the opening wrestling scene, it would have made little difference. Still, I did like the fact that he was more fallible than usual. Town yokels occasionally get the drop on him, he makes tactical mistakes, and is never entirely sure the nature of the ongoing scheme until late in the film. Riders of Terror is a weird blip in the Santo oeuvre. It is interesting in the way it constantly defies acting like any Santo film that has come before it. It does feel that Santo himself was merely pasted into an already written script, but his presence still gives it that edge that transforms it from just a cowboy story into something a little stranger.